Day 7 I was a bit slow to start, but decided I wanted to have a look a Coney Island. This much hyped landmark has been touted in movies and more since I was young. Fortunately the main subway line I have been using here is Brooklyn went right to the beach, so out the door and on to my next adventure. What I didn't realize was that it was much further than it appeared on the subway map. By the time I rode the bus to the subway and then road the over 25 stops it took to get out there, it was well over an hour of travelling. I would really like to say it was worth it, but the area was a bit depressing. The midway portion with rides was not running, so there were only a few vendors selling those super discount items like 4 NY baseball caps for $10. The walkway along the beach is a beautiful wooden boardwalk, but there were just a couple places to eat, have an ice cream or get a t-shirt open. You can walk out on the wharf to hang out with those fishing and have a look back at the shoreline. The classic, old-fashion beachy welcome sign was still up was nice to see and many of the trash cans on the boardwalk sported splashes of colour. When I went back to the main street that ran along the beach, at least half of the shops were closed with those metal gates pulled down. Very sad! I was told by someone on the bus they had raised the rents to force out all the small, quaint shops and were trying to get a casino approved and high end chain stores into the area instead.The only 2 interesting places that caught my eye were: A fast food place called Nathan's Famous that has been around since 1916. They still had the old neon sign up which I loved and I found a photo on their website of the old 1920's location. Then there was the Coney Island Circus Side Show and Freakshow Hall of Fame. I did not go in, but if you're looking for some unusual entertainment, I think you'll find it here. Love this 1920's image from their website. There were still some great photo ops. The Coney Island Subway Station here is above ground and the most interesting one I had been in other that the grand dame - Grand Central Station. I loved all the lines and that flowed throughout the building. It was intriguing to watch a few South Asian immigrants cast net fishing. They took a circular net with weights around the outside edge, folded it all up and then flung it off the dock when they saw a fish. As they pulled it up the weights would draw the net in to enclose the fish. I never saw them catch any, but it must work as there were at least 2 groups using this method. I also love the the pattern of colours shooting through the closed gates towards the midway rides. 2 beach photos are included just for fun. On the left is a guy in long pants and shirt relaxing in the shade of totally fake palm tree. It was hilarious The other photo on the right shows a very dark-skinned girl sun bathing. She is not dark because she tans, she is naturally dark and was working on a tan any way. How weird. On the way back to Brooklyn I was floored to look out the train window (at this point it sill ran overhead) and see an enormous cemetery that spanned several blocks on both sides of the track. 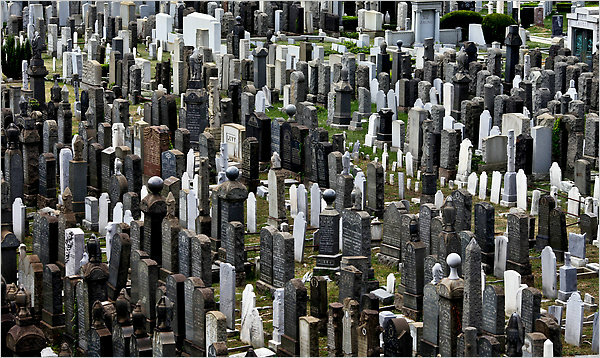 It was the Washington Cemetery - a predominately Jewish burial site. The closeup I found below on Google Images looks like the skyline of a city of skyscrapers. Interesting note - most of the cemeteries in Brooklyn date back to the 1850's and most have run out of space. You can read more on that HERE. Back at the apartment it was business time as the 3 of us tried to get ready for the fashion show that night. We made it downstairs only minutes before the car service arrived. The Brooklyn Bridge had an accident on it, so getting to the Bryant Park Hotel downtown was a laborious journey and we were glad someone else was in charge of. At the hotel it was non-stop as there were several models that hadn't come for fittings and several changes of models to replace a few that had dropped out. Like all fashion shows, there were the usual glitches, but in the end the models were amazing and so easy to work with; the garments created for this collection had come together brilliantly and I can honestly say it is some of the best work designer Katherine Soucie of Sans Soucie has done to date; and the models did their job showing off the garments both for the pre-show press and the final event. I don't have any professional shots at this point from the show, just a few I took behind the scenes, but I love them all. 3 models ready for pre-show press. Zombie make-up to 2 dancers. While ALL the models looked great in their garments, sometimes you get an unexpected surprise. We had one very blonde model with a lot of tats whose sleeves totally meshed with the colours and pattern of the top and skirt she was wearing. I snapped a quick photo (on the left below) before she stepped out, but it doesn't really show how great it looked her. On the right are 2 of the wild women who were showcased in a segment by Candy Rock Couture. I had to move quickly to catch these 3 working behind the scenes in a temporary pause before the show began - photo on left. They are from Mad Girl Productions who organized this event. On the right below is Katherine Soucie with the 2 hair stylists/make-up artists who did double duty that night as dressers - Thomas Duffy and Samantha Ariel. We wouldn't have made it without them. The last 2 photos here are a couple of great memories. First is designer Katherine Soucie and Vancouver musician Shockk Mongoose taking a short break before the show begins. Shockk Mongoose played live while the models walked during the Sans Soucie fashion segment and he totally rocked it. Then there is the photo that is so reflective of how truly global the world has become. After the show I walked into the venue only to hear - HI MARILYN! It was a friend - Frances MacDonald - from Vancouver who was in town and just happened to pop by the show. It was 1 a.m. when we finally rolled back into our apartment in Brooklyn. And so ended Day 7. Obviously we slept in late the next day!